Guanajuato is a city and municipality in central Mexico. It was founded in 1559 due to the region's rich silver and gold deposits. Opulent colonial buildings, stunning tree-filled plazas and brightly colored houses are crammed onto the steep slopes of a ravine. Being best known internationally for its acclaimed annual international arts festival, the Festival Cervantino, the city is also home to one of the world’s scariest museums - the Mummy Museum (El Museo De Las Momias). PanARMENIAN.Net - 111 bodies of mummified men, women, and children are on display, many with gaping mouths shaped in eternal screams from having been buried alive and buried during the cholera outbreak in 1833. They were gradually dug up from their final resting places between 1865 and 1958 because their surviving relatives were unable or unwilling to pay taxes to keep them interred. Weirdly, due to the extremely dry conditions of the soil, the corpses often came up as well-preserved mummies (the first to be dug up and found mummified was one Dr. Remigio Leroy on June 9, 1865.) The cemetery kept these strange mummified corpses underground in an ossuary — actually under the cemetery grounds itself — in case the relatives came around with the money wanting a re-burial. It has been estimated that approximately 2% of bodies mummified. These bodies were stored next to the graveyard, where workers charged locals 3 pesos to view the mummies. This practice of exhuming bodies continued well into the 1950s. In 1970, a Mexican horror movie was produced there called “Santo Versus the Mummies of Guanajuato”, starring masked wrestler Rodolfo Guzmán Huerta. By 1894, the ossuary had racked up enough mummified bodies to rebrand itself as a museum to enter which 50 pesos ($2,5) are needed today. In 2007, Guanajuato Mummy Research Project was initiated to raise awareness of the mummies, which were examined in Mexico and the United States. The study found evidence of medical conditions such as rheumatoid arthritis and tuberculosis those people suffered when alive. 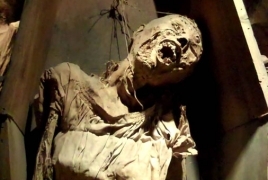 Mummies Museum is by no means a family orientated attraction and most sensible tourists dislike the thought of viewing mummified bodies, which are a little over 100 years old. However, usually curiosity prevails and over 4,000 visitors every week find themselves a macabre room, 15m in length, in which two long lines of mummies are displayed behind two panes of glass, which form a path that the visitor must walk along. One glass case contains three agonized mummies: a man whose fatal stab wound to his abdomen is still a visible puncture in his parchment-yellow skin, a drowned man whose rigor mortis set his writhing legs in the form of a frog's, and an unmarried pregnant woman who was buried alive by her own family, her screaming face covered by skeletal hands. There are mummies of Catholic children, who were dressed as angels, if girls, or as saints, if boys, to indicate their purity. The Saint Paola Cemetery, the museum's source of mummified remains next door, is made up of entire walls of individual crypts, seven tombs high. Those which are occupied are bricked up from the outside and sealed with a placard denoting its occupant, those which are empty leave dark square holes in the flower-decked facade. When a family's lease on their loved one's crypt expires, they are given five days to renew the payment about $118 for twenty years. If they choose not to pay, the body is removed and given to the museum's curator for inspection. If the curator finds it's condition good enough to appeal to the huge numbers of visitors his museum receives, it is added to the collection. If rejected, the body is sent to a common grave on the outskirts of town. “The Mummies of Guanajuato are totally incorporated into the culture of Guanajuato’s inhabitants; from both a historical and social standpoint, they represent the different stages that have allowed this city to reinforce its position today as an important domestic tourist destination. Conserving and enlarging the cultural heritage associated with the mummies’ legacy has also been the object of painstaking scientific studies carried out by American specialists in forensics and anthropology,” according to Guanajuato Mayor Luis Fernando Gutiérrez Márquez. The museum was voted as one of Mexico's best tourist attractions by users of one of Mexico's most popular tourism websites.